are the very thing I didn't want to hear. from which you had awakened. 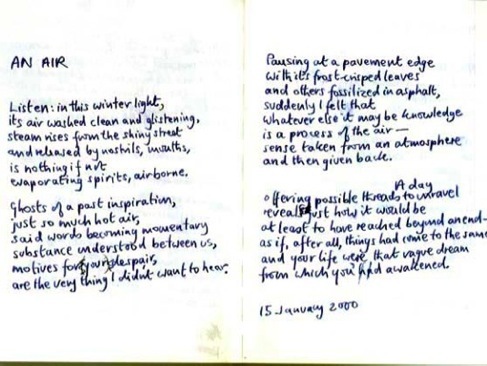 The date in my notebook says it was finished on 15 January 2000, and the poem is to appear in a magazine called The Reader published in Liverpool. It's a piece composed from an interaction between life and the life of writing. 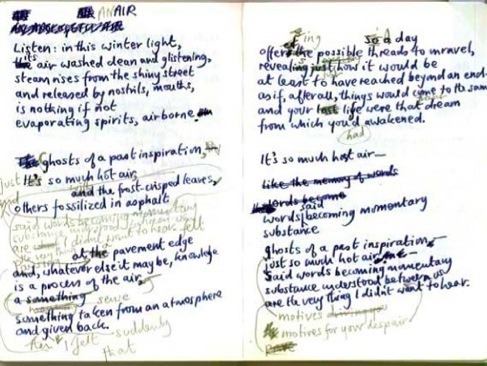 The first notebook page reproduced here shows the last draft of an abandoned poem called 'Obituary Notice'. 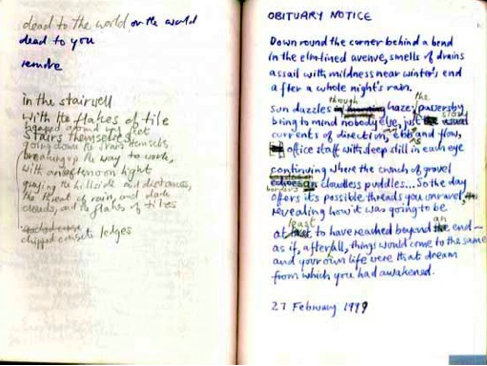 This was written in the late winter of 1999 and is an attempt to evoke the momentary sensation of being 'dead to the world' - as if I had somehow outlived myself. The trouble with this conceptualization of the feeling is that it appears to be almost objectless - purposeless and without material equivalents - in the draft. I abandoned the poem not only because it didn't convince me I had made something useful of the momentary sensation, but also because the quatrains don't have sufficient formal interest or development. However, less than a year later I was badly shocked by the sudden and unexplained death of a young acquaintance. Become rather obsessed by this event, I tried to write a few poems to exorcise it and found myself remembering the ending to that abandoned lyric of the previous winter. A glance at the intermediate draft also reproduced here shows that I had now found a coincidence of observation and reflection (the breath and steam seen in a cold winter street after rain) and I had an ending - the lines lifted more or less whole from 'Obituary Notice'. 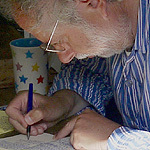 Now the job of writing involved drafting some lines which would develop the opening and simultaneously lead into the conclusion. One of the reasons why I like the finished poem , 'An Air', is that by being a collage both of different lived occasions (my own sensation of being dead to the world, and the shock of another being actually dead) and of separate compositional moments, the resulting work is not anything that I exactly planned to be the way it is: the later event had brought out a meaning in the earlier lines that hadn't been there when I wrote them. The best I can say for this particular process of working and revising is that by rescuing and salvaging the old lines I was able to dramatize, for myself at least, a thing that the poems connected with this death surely try to do - to bring value and benign pleasure to the contemplation of an event in life that can have involved absolutely nothing of either. Written 2 - 15 January 2000, employing passages from an unpublished poem, 'Obituary Notice' (27 Feb - 5 Mar 1999), in Yagiyama, Sendai.